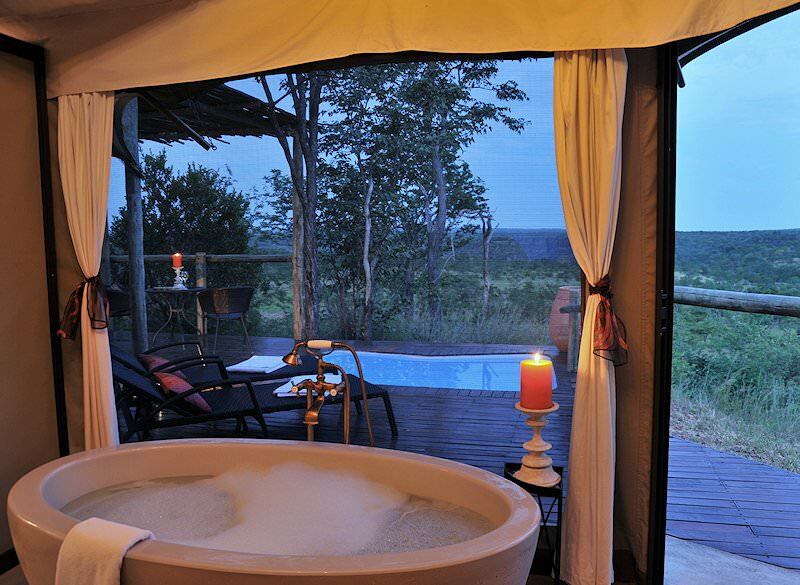 Elephant Camp provides luxury five star safari accommodation near the Victoria Falls. Elephant Camp, the prestigious Wild Horizons flagship safari lodge, is located in the Victoria Falls National Park near the Batoka Gorge. This wild setting is where the turbulent waters of the mighty Zambezi River churn and thunder before winding eastwards towards the Indian Ocean. 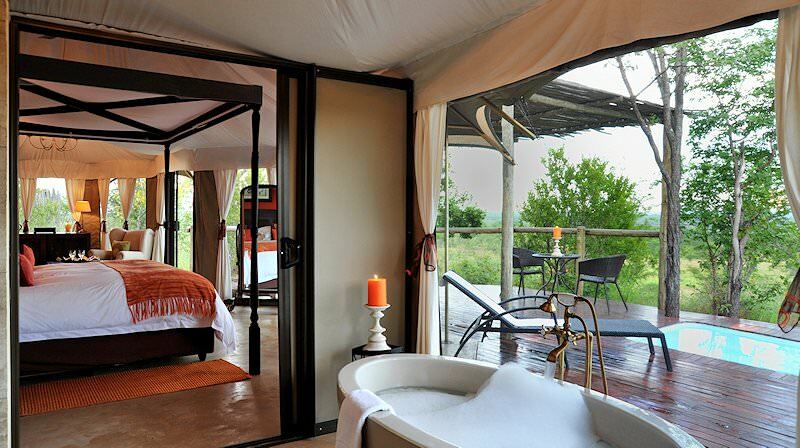 This camp offers a prime location for a luxury safari package. 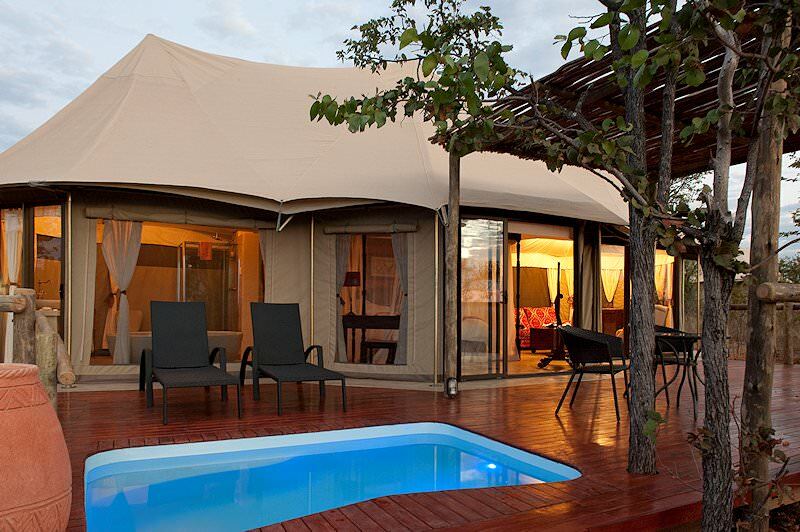 Probably the best and most exclusive accommodation on the southern banks of the Zambezi, Elephant Camp offers a maximum of just 24 guests a five star African safari experience in 12 luxury en suite tents. 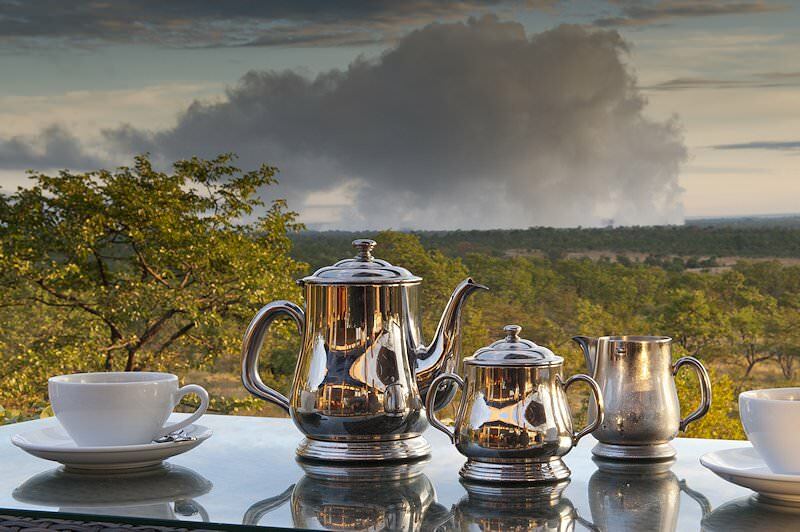 The lodge is entirely under canvas, with panoramic views of the nearby gorge and the mist from the Victoria Falls. Elephant Camp's fortunate guests will enjoy up-close experiences with the resident elephant herd, located at the nearby Wild Horizon's Animal Sanctuary in their own private game reserve. Guests are hosted on a full-board basis. 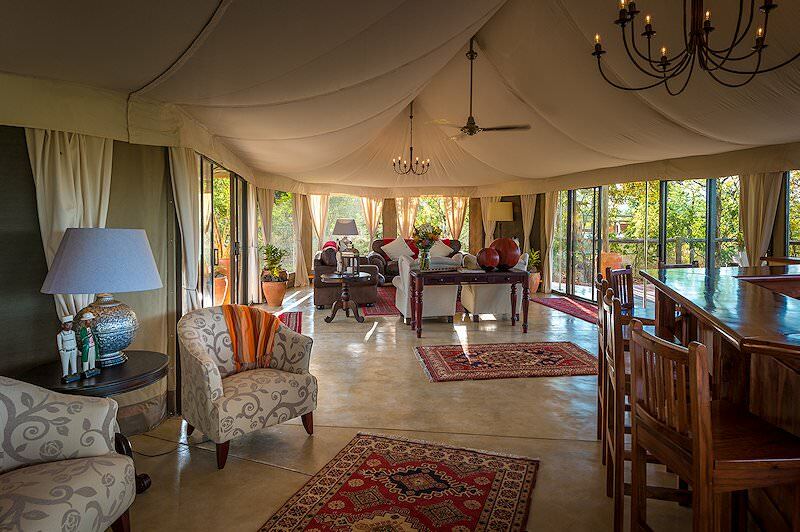 Your suite facilities include a private viewing deck, plunge pool, en suite bathroom and air-conditioning - essential in the hot African sun. 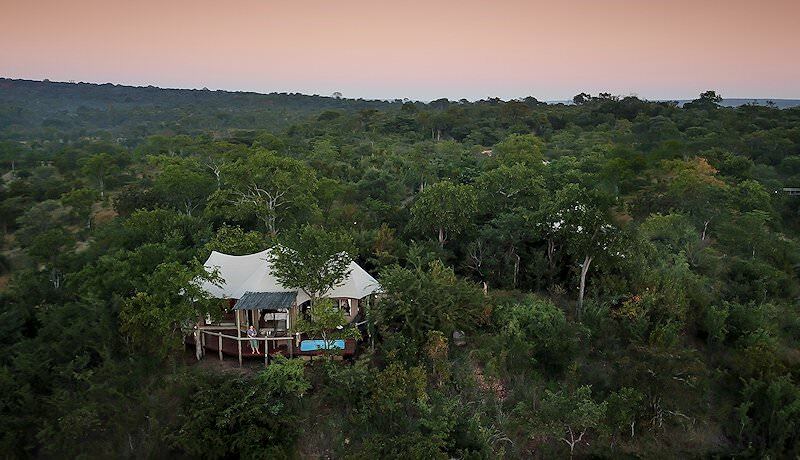 Relax on your deck and enjoy a refreshing beverage from your personal mini-bar as you revel in yet another spectacular sunset over the Mopane woodland in this magical corner of southern Africa. From the lodge as a base, guests have access to a host of safari activities on offer in the region, from elephant-back rides to walking with lions. A visit to the spectacular Victoria Falls is always included, while the local wood and stone carvers are world-renowned for their skills. A sunset cruise on the Zambezi is a fitting end to your Victoria Falls safari, offering magical sunsets and spectacular scenery as you quietly navigate this stretch of Africa's fourth-largest river. 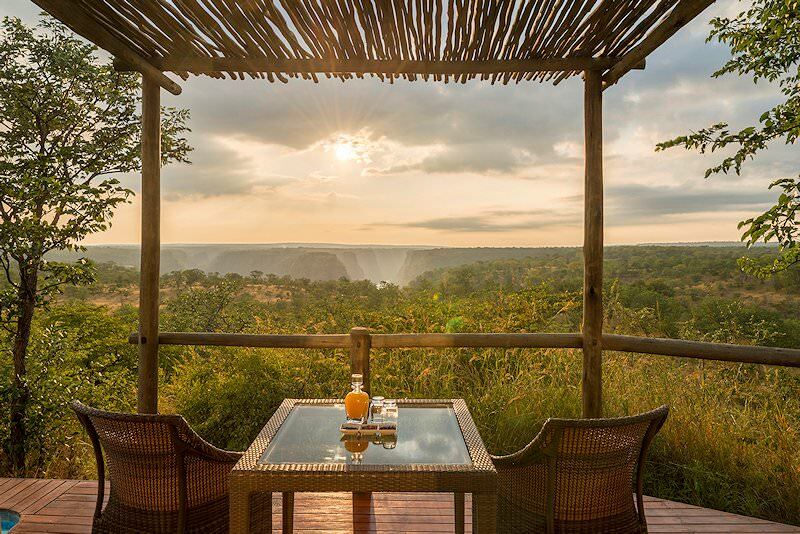 From O R Tambo International Airport, guests fly to Victoria Falls and are transferred to Elephant Camp on the banks of the majestic Zambezi River for their Victoria Falls safari. 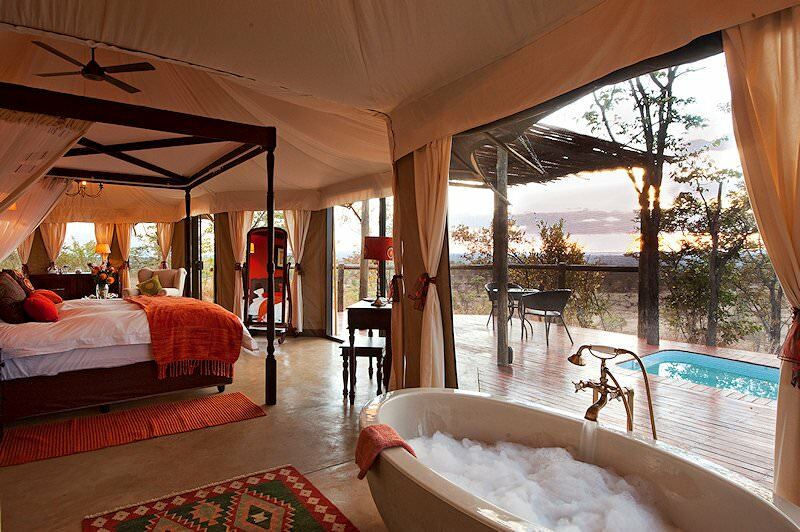 This luxury lodge offers an authentic wilderness escape flavored by the folds of luxury. From open 4x4 game drives to interactions with the local sanctuary's resident elephant herd, wildlife encounters abound and make this a very popular African safari package . Observe the striking red and gold violence of an African sunset from the cool reprieve of your tent's own plunge pool or viewing deck. Spend your unforgettable evenings under the lustrous silver gaze of the night sky, or opt for a river cruise on the wild waterways. 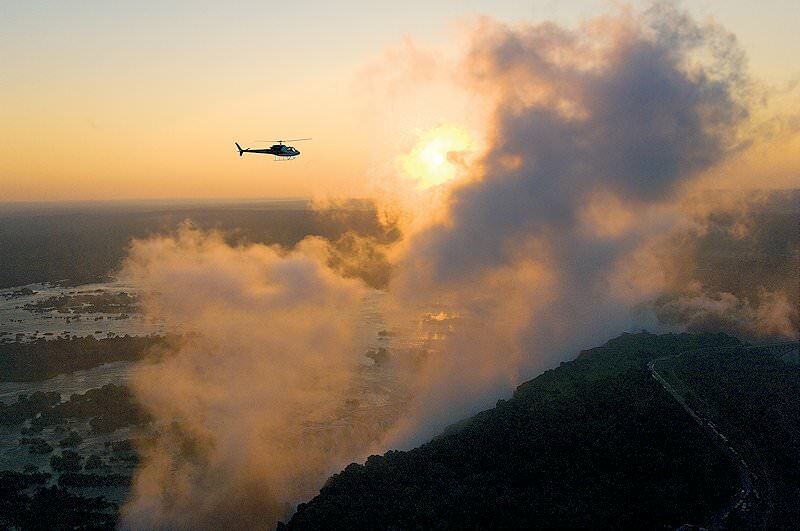 A Victoria Falls safari is naturally incomplete without a visit to the awe-inspiring thunder of the falls. 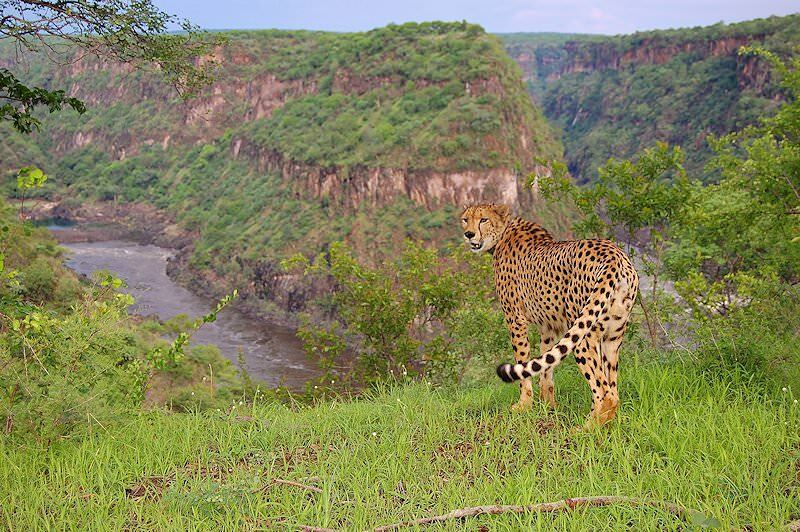 For an adrenalin rush, add white river rafting in the Batoka Gorge to your safari package. 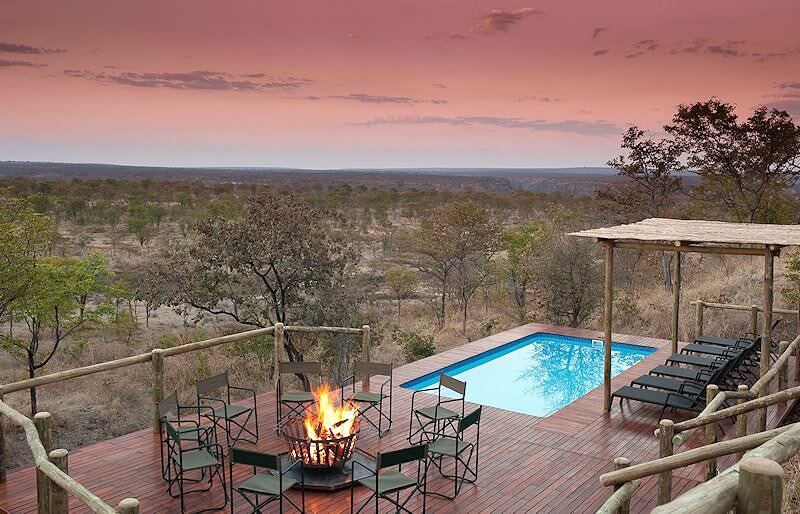 African Sky recommends Elephant Camp both for its exclusivity and location, arguably the best in Victoria Falls. The images really do not do the lodge justice, but rest assured, as we are able to personally attest that your stay here will be most enjoyable indeed. There are other accommodation alternatives, but in our opinion we consider them to be compromises. With your stay here being full board, at the end of the day, this really is good value compared to what is on offer elsewhere, especially when one considers the cost of meals and transfers, which are included. 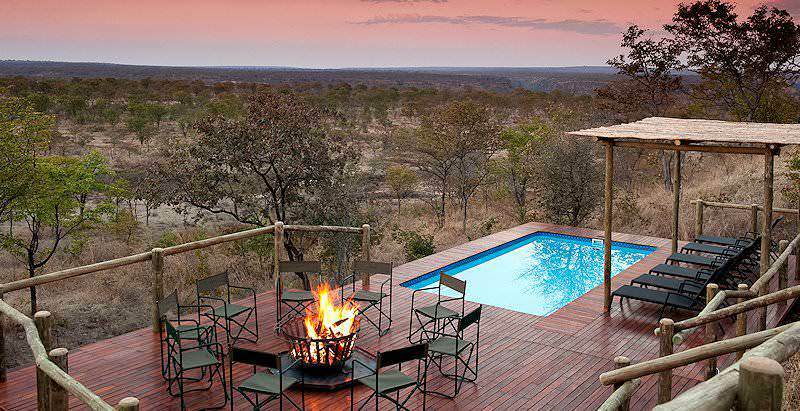 South Africa's safari areas include a handful of malaria-free reserves & national parks. Botswana's wilderness areas are replete with wildlife and natural beauty. Namibia's top safari destinations are Etosha, Sossusvlei and the Caprivi. Zambia's wilderness areas are wildly remote, offering extremely rewarding safaris. Zimbabwe's wilderness areas are low in tourist traffic, offering exceptional safaris. Mozambique's warm waters and pristine beaches make it a top safari destination. A luxury African safari will transport guests to truly wild locations while they enjoy pampering five star accommodations. The Big Five include the lion, leopard, Cape buffalo, elephant and black rhino, and are the continent's most impressive mammals. 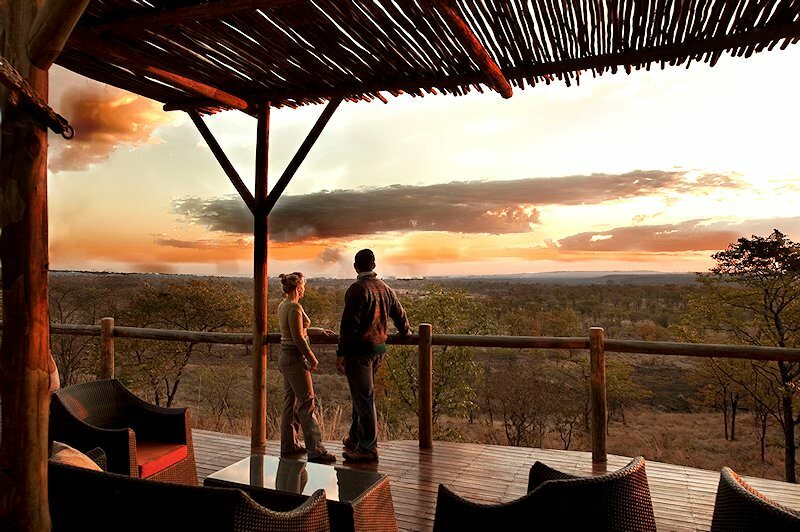 The African lodges we use are tucked away in the continent's wildest corners, from the Okavango Delta to South Luangwa.